In a Halloween themed protest, women and men occupied the street outside the offices of the “truly scary” Bechtel Corporation at 707 Wilshire Blvd in downtown Los Angeles beginning at 5 pm on Tuesday, October 28. 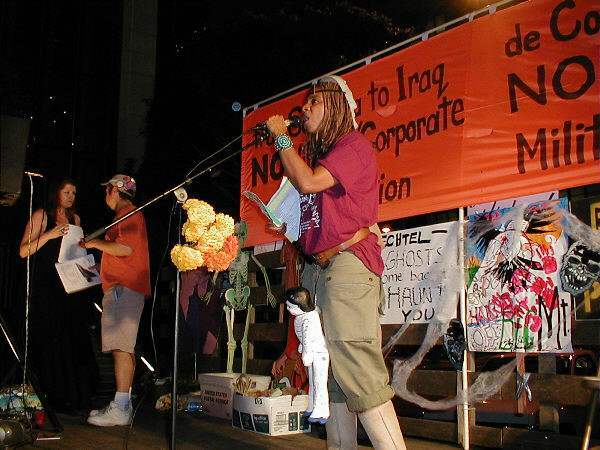 Protesters used music, costumes, spoken word and more to highlight Bechtel’s rap sheet of profiteering from weapons, war and water privatization. 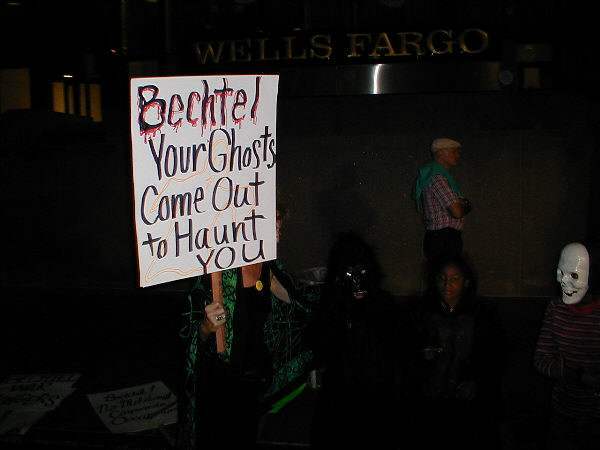 In a Halloween themed protest, women and men occupied the street outside the offices of the “truly scary” Bechtel Corporation at 707 Wilshire Boulevard in downtown Los Angeles beginning at 5 pm on Tuesday, October 28. Bechtel, the world’s largest contractor, is the second largest recipient of money to rebuild Iraq. 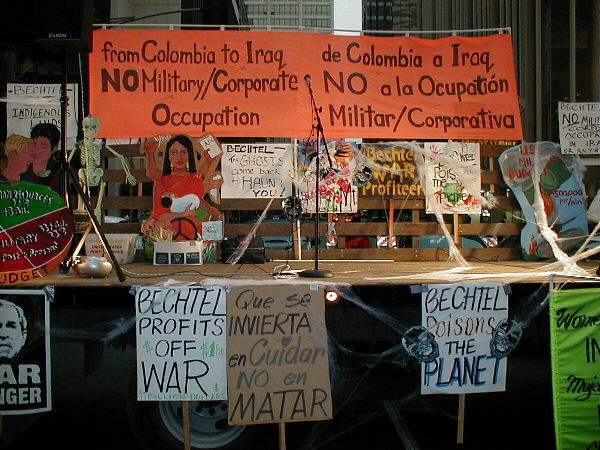 Tuesday’s protesters used music, costumes, spoken word and more to highlight Bechtel’s rap sheet of profiteering from weapons, war and water privatization. Women, everywhere the caregivers of people and the environment, pay the highest price for Bechtel’s profits. The Los Angeles protest was called by the Global Women’s Strike. Co-sponsors included Action Resource Center, Alexandria House, ANSWER Coalition, Coalition for World Peace, El Sereno Neighbors for Peace and Justice, Office of the Americas, and San Gabriel Valley Neighbors for Peace and Justice. It was endorsed by Interfaith Communities United for Justice and Peace, South Asian Network, and many others. There were 100 people at the action, a very mixed crowd, lots of young people, older people, speakers representing a wide range of groups, including East Side grassroots organizers Roberto Flores and Al Maldonado, Blase Bonpane of Office of the Americas and host of KPFK’s World Focus, Karin Pally of Women in Black, Heather Shreck of the Afghan Women’s Mission. Anti-war and anti-occupation artists included Kerry Getz, well-known singer and songwriter; Ngosi, teenage spoken word performing artist; the satiric, unique Billionaires for Bush with Bechtel Lagosi privatizing blood; The Invisibles with a hit CD “I Can’t Take Any More”; new women’s trio singing Chandra Redack’s Song for Bechtel. The Raging Grannies and Sunset Hall elders were there in masks and costumes. 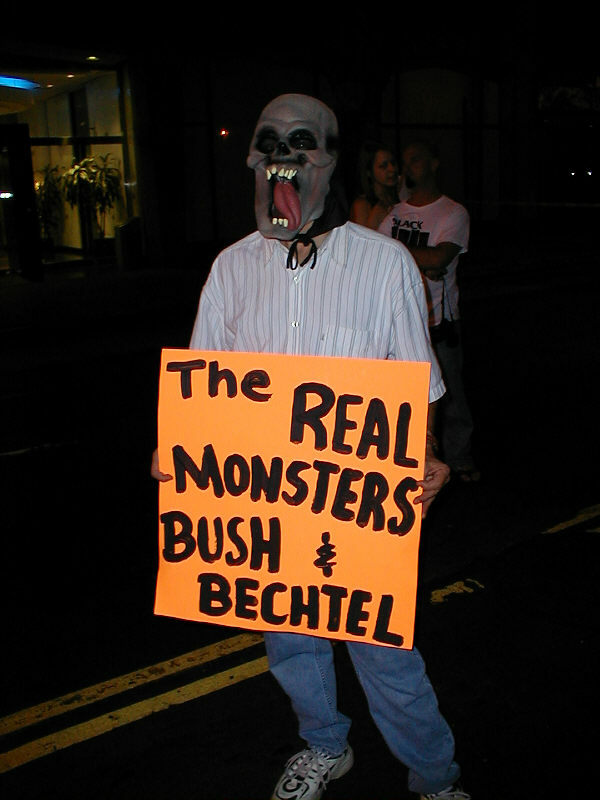 Vigilers with signs like “the real monsters Bush & Bechtel”, “Bechtel: Your Ghosts Come Out to Haunt You!” and scary masks got continuous honking approval. Children in gorilla suits passed out skeleton masks. Witches leafleted and passed out Bechtel’s Global Rap Sheet, the dirt on Bechtel, to people coming out of the building. 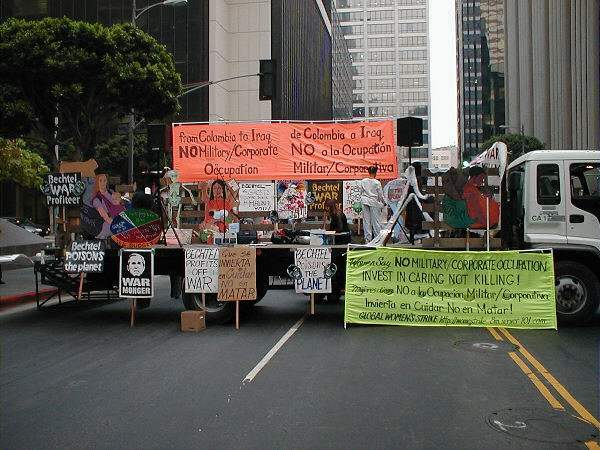 “US foreign policy is aimed at protecting the profits of multinationals like Bechtel and Halliburton through war, occupation, racism, destruction of the environment and other policies. While billions go to Bechtel and Halliburton in no-bid contracts, cuts are made in healthcare, childcare, welfare, basic civil liberties, and more to pay for war and occupation”, said Margaret Prescod of Women of Color in the Global Women’s Strike who coordinated plans for the protest. “Bechtel built nearly half of the world’s nuclear power plants and are now invading Shoshone land to oversee the construction of the Yucca Mountain nuclear power dump site, and their history with Peabody Coal resulted in the displacement of thousands of Navajo people“, said Sharon Lungo of the Action Resource Center. Bechtel is also moving globally to privatize water, resulting in no or limited access to clean water; in South Africa, this has resulted in massive increases in cholera particularly among infants and children. In Soweto, SA, there have been massive protests against water privatization, and in Bolivia Bechtel’s efforts to privatize water were defeated by a grassroots rebellion led by women. 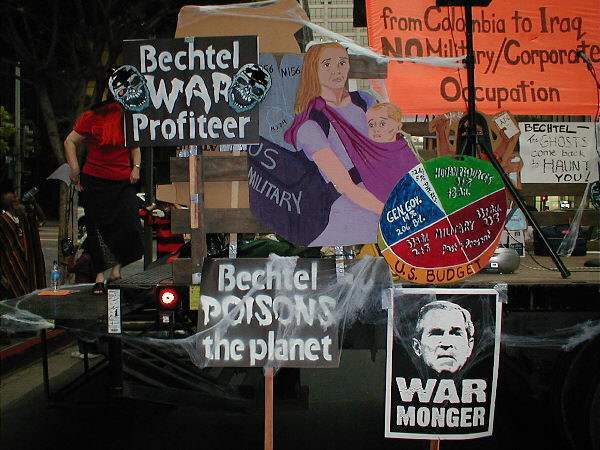 In San Francisco, the Global Women’s Strike network (GWS) has been picketing outside Bechtel’s corporate headquarters every week since last March, inspired by the network’s daily anti-war, anti-occupation pickets in Parliament Square in London. In LA the GWS says that they will now start to hold weekly protest events outside Bechtel. For more information, call 323-292-7405. Listed below are the 10 latest comments of 5 posted about this article.